Hay Bro Sis...The new KTM MotoGP has already taken a roll, and has done so at the Red Bull Ring in the hands of Alex Hofmann. KTM plans to officially return to the championship in 2017, and next season will work in the development of his bike. One of the most important developments of the MotoGP season in 2017 will be around KTM championship. 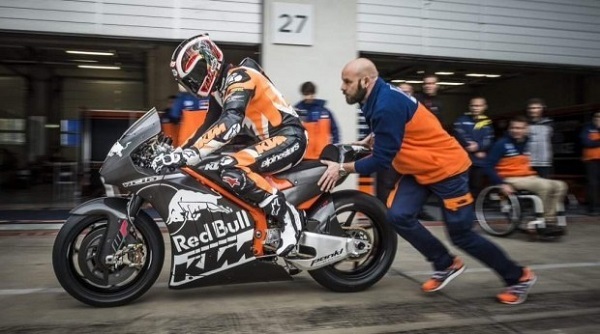 The first step has already been taken, since the first prototype KTM RC16 has already given his first laps on the circuit Red Bull Ring in Austria with German Alex Hofmann at the controls. In view of the images, there is no doubt that the bike rolled in Austria has a genuine identity KTM thanks to various details. Alex Hofmann was responsible for shooting at the Red Bull Ring, and share the development work with Mika Kallio next season. At first glance, this prototype is clearly inspired by the Honda RCV, with its grand entrance to the “airbox” and exhaust outlets on the right side and the tail, much like Honda, which suggests Given the narrowness of the whole, which is a V-4 engine, the same engine configuration developed by KTM in 2005 and equipped the Proton KR. Surprise your frame, steel trellis, in line always followed by the Austrian brand with Moto3, although his time of 125 and 250, the FFR outfitting twin-spar aluminum frame. Of course, this MotoGP has a generous aluminum swingarm. The brakes are Brembo, but WP suspensions are marks owned by KTM, an option that is unprecedented in MotoGP, which is mostly used and sometimes Öhlins Showa, although there Moto2 teams that equip this brand. The Austrian prototype will take almost a year and a half to prepare your new machine for the premier class with a V4 engine inside and ideas taken as the Honda RC213V setting and the Ducati Desmosedici. Such latter takes the position of the fuel tank. KTM and Mika Kallio hired as a test driver for all 2016, with its experience in MotoGP seasons with Ducati Pramac in 2009 and 2010. He also is looking for the private team that will have access to the championship as the new regulation requires. He has already had contacts with the team Cardion AB Karel Abraham in this sense.